Verderflex’s Dura 5 and Dura 7 systems combine a close-coupled pump’s compactness with traditional long-coupled pump benefits to create superior high-pressure, low-volume dosing solutions. 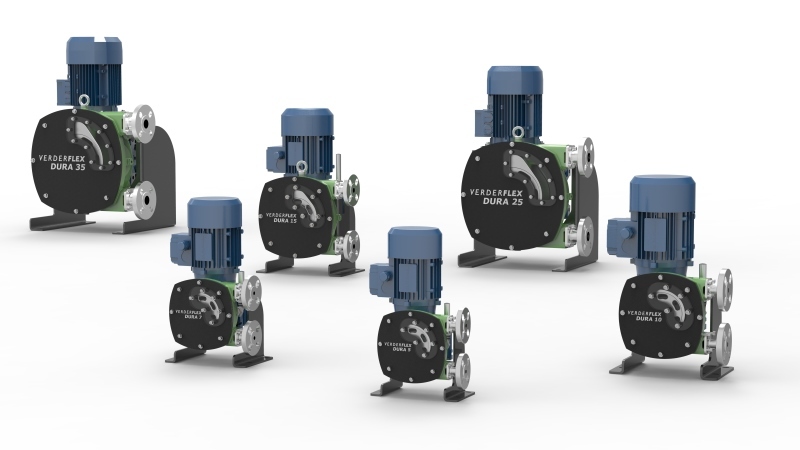 Unlike traditional high-shear pumps that reduce flocculent particle sizes and result in both increased chemical use and higher operating costs, the Verderflex Dura 5 and Dura 7 bring gentle pumping to sub-litre-per-hour flow rates. Off-gassing liquids such as Hypo often cause traditional pumps to vapour lock; however, the Verderflex Dura 5 and Dura 7 readily pump these liquids with ease. With no valves or stators to wear, Verderflex Dura 5 and Dura 7 pump lime and similar highly abrasive chemicals at a pressure of 5bar-8bar with minimal downtime. In addition to the above advantages, the simple-to-use Verderflex Dura 5 and Dura 7 provide scalable performance and low maintenance. They are an excellent chemical dosing solution for the water-treatment, brewing and food industries, with much lower operating costs. Please contact Verderflex via the enquiries form for more information.